Mashiro's true body is revealed in episode 25, encased in a crystal star. 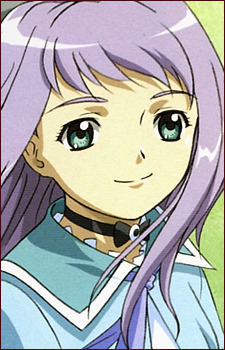 She is also further revealed to be the winner of the previous HiME carnival as well as the former user of Kagutsuchi, Mai's Child. In the final episode, Miyu's anti-materializer frees Mashiro, and she floats up to the Crystal Shrine. She revives the fallen HiME, resurrecting them and their loved ones, and restoring their HiME powers. In the ending credits, Nagi and Mashiro (still in a wheelchair) enter the large doors at the far end of the library. Powers In episode 21, Mashiro displays two abilities: the ability to create a barrier preventing eavesdropping, and the ability to transform into a Child. As Fumi's Child, Suishou, she radically changes appearance and wields a double-sided blade, and bears Kagutsuchi's crest of three tomoe on her robe. In her true body in episode 26, she is able to appear in spirit form to multiple people, revive the dead, and restore the powers of fallen HiME.